find locations of interest to Freemasons and their friends. Also available are links to the ‘Masonic Family’ in Maine. not represent the views of the Grand Lodge of Maine, AF&AM. Clicking on a link will open a new window in your browser. The Masonic Service Association of North America has a wealth of information about Freemasonry available through its Short Talk Bulletins and other publications – and the cost is well within nearly anyone’s budget.This site also has information about the important Hospital Visitation Program which provides support and encouragement to our hospitalized Masonic military veterans. Do drop by their site and browse around! Another excellent resource which provides extraordinary and in-depth analysis of the most egregious claims of anti-Masons can be found on the web site of the Grand Lodge of British Columbia and Yukon‘s where Trevor MeKeown has invested a tremendous amount of effort to address the irrational and erroneous charges leveled against us. 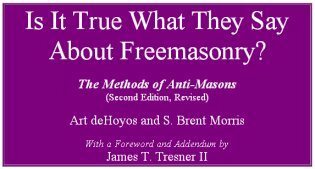 And finally, there’s an opportunity to read online and at no charge the excellent book, “Is It True What They Say About Freemasonry?” by Brothers Art deHoyos and Brent Morris. One of the best books ever written on this topic. on the web for Masonic Research. Drop by and visit them too. Leighton of Newport, Maine the Masonic Poets Society is well known via links from around the world. Looking for something for a lodge meeting, for your own inspiration, or to share with others? Check out this excellent site. Consider contributing something of your own as well! site and poke around. It’s well worth the hours you’ll spend there.